Jerry Dias: “At this moment, we are not calling for a boycott of GM vehicles." 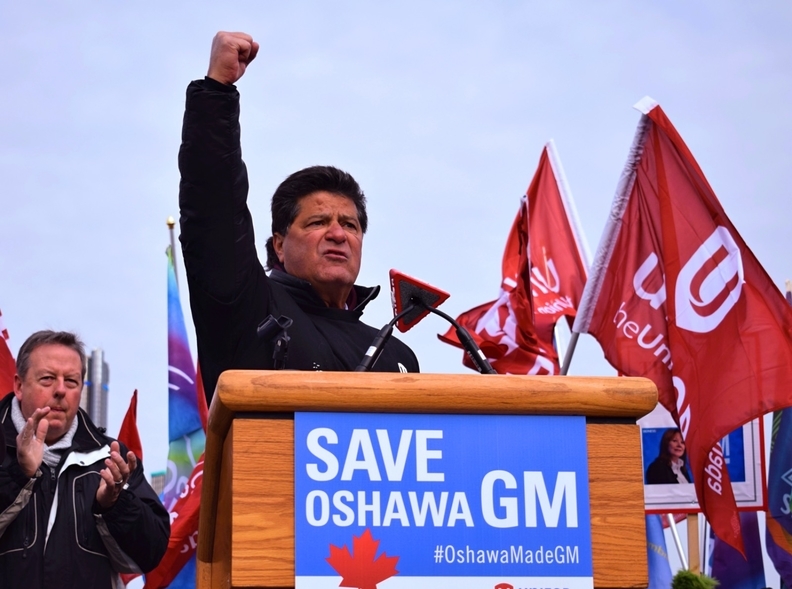 To boycott or not to boycott is the question Unifor President Jerry Dias must eventually answer when it comes to his plan of attack against General Motors, which has said it will close its Oshawa, Ont., assembly plant after 2019. Initially, the union called for Canadians to stop buying GM products — after 2019. The fiery union boss said again this week he “will never call for an outright boycott.” But that hasn’t always been the case — and it might not remain the case as his battle against General Motors drags on. The tone changed after the automaker reviewed — and rejected — union proposals to save the plant and told Dias as much in a face-to-face meeting in Detroit on Jan. 8. “We are not calling for a boycott, but we are asking Canadian consumers to continue showing their displeasure with this decision,” Dias told reporters after that Motown meeting. Three days later, at a rally in Windsor, Ont., on the banks of the Detroit River and in the shadow of GM’s world headquarters in Detroit, he reiterated the point three times. One of Unifor’s proposals to save the Oshawa plant was to have GM move Chevrolet Blazer production there from Mexico. His brothers and sisters in the UAW in the United States have done what Dias has avoided; they have decided to boycott the Mexico-made Blazer. It’s something a few vocal Unifor members want — and likely plan — to do given the fact there was more than a handful of protesters among the 2,000 in Windsor who made it known they wouldn’t buy GM again. But Dias might have good reason to not boycott — yet. It’s possible company executives warned him that if he called on Canadians to stop buying GM products, the CAMI assembly plant in Ingersoll, Ont., and the St. Catharines, Ont., propulsion plant could be next to close. But, so far, bluster and flag-waving outside the windows of Detroit’s Renaissance Center and GM Canada’s headquarters hasn’t worked in getting GM’s attention. Few things hurt a brand more than bad public relations and dwindling sales — and right now, after a 30-per-cent drop in December sales, GM is acutely suffering both in Canada. A boycott might just be the only weapon Dias has left.